Tracking key performance indicators (KPIs) is the only way to know, with any degree of accuracy, what on your website is leading to results and what needs to change to help your business grow. It is essential that you track the right KPIs, as some, depending on your business, may provide you with useless information. 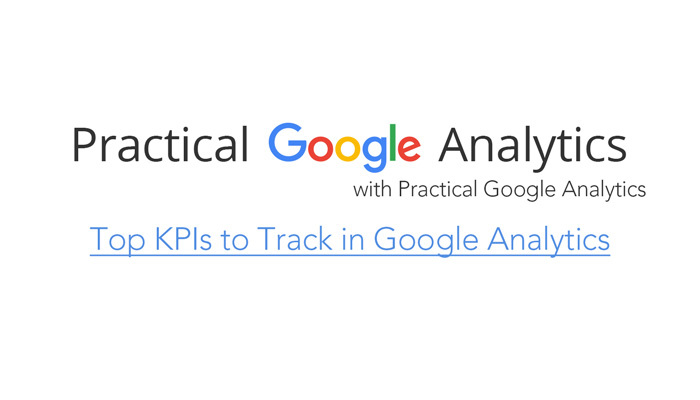 Understanding what each KPI is and how it is useful is a good place to start. You can then find all the data in Google Analytics. Tracking conversion rate is the only way to know if users are taking the desired action on your site. Possible conversions include signups to a newsletter, downloads of premium content, and clicks. Choose a conversion that matters to your business goals. 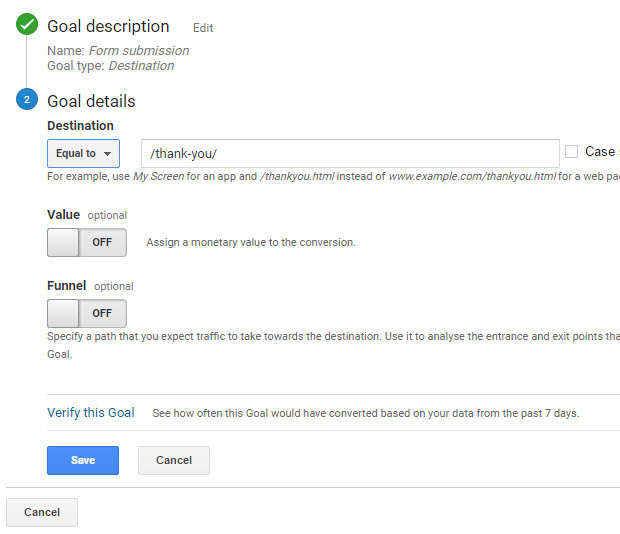 To track conversions, set a goal in Google Analytics. You’ll need to specify the type, of which there are four possibilities: destination (for the view of a particular page), duration (for a certain amount of time spent on a page), pages/screens per session (for a specific number of page views), and event (for an action like a click on a button, a download of a file, or the playing of a video). Furthermore, if you wish, you can assign a monetary value to a conversion and specify path you expect traffic to take to reach a goal. Lastly, before you save the goal, you can verify it. This will show you how often the goal would have led to a conversion in the last seven days. The above will give you information about leads, but you also need to know about conversions to customers. 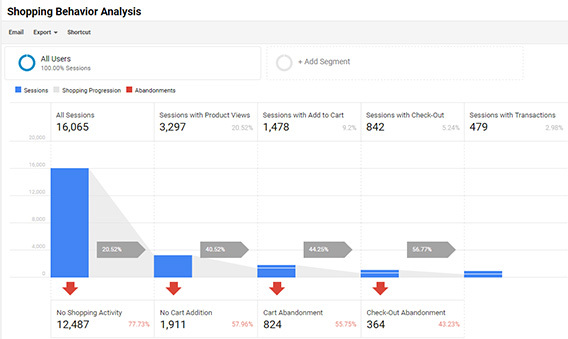 You can monitor your sales with ecommerce tracking in Google Analytics. If you just want reports about product and transaction information, average order value, conversion rate, and time of purchase, use standard ecommerce tracking. If you also want to see when customers added items to carts, began the checkout process, and completed the purchase, you should use enhanced ecommerce. This will also show you which segments of customers are falling out of the shopping funnel. Whichever you choose, as soon as you set up tracking, you’ll see ecommerce conversion rate, transactions, and revenue by traffic type. To give the data more meaning, compare different time periods. This will show you if a particular campaign or strategy is working. Click the date drop-down menu to choose timeframes to compare. If you recently made a major update to your website, compare the last seven days to the previous week. To examine the impact of an SEO campaign, though, data from one month to the next will be more useful. Finally, to examine trends, turn to year-over-year data. Before you can increase your revenue (from organic traffic and paid), you need to track average order value. Find this KPI by heading to “Conversions.” It is under “Ecommerce” in “Overview.” Once you know how much your customers are currently spending, you can implement strategies to increase purchase values. Another way to increase spending if you have an online store is to reduce abandoned shopping carts. Find current abandonment rates by enabling enhanced ecommerce and then heading to “Shopping Behavior,” which is under “Conversions” followed by “Ecommerce.” The data will show you how many users complete and abandon each step that leads toward a sale. When users decide a website has little to offer them, they leave after viewing just a single page. Each one of these sessions adds to your bounce rate. In some cases, a high bounce rate is not necessarily negative. For instance, if users at the top of the funnel are bouncing, it could be because they are finding everything they need. For instance, they may be finding the answer to their query in your content. However, if you have a high bounce rate on a key page of your site, like the home page, you may have a problem. For this reason, you need to consider bounce rate according to the page. To examine bounce rates for different pages, head to “Behavior,” then “Site Content,” and finally “All Pages.” Here, you can also check the bounce rate of organic traffic by changing the segment. By tracking the above KPIs, you increase customer value, reduce costs per acquisition, and better focus your efforts on activities that matter. Ultimately, this means increasing your ROI and allowing your business to grow.